Build your trust, authority, credibility, and sales with TrustLock Verification Badges today. We’ve extensively tested our badges with various text options and after careful internal research realized that the simple words “Verified Privacy Safe” was the best phrasing possible to increase perceived privacy by visitors. While other brands rely on visitors assumptions that their brand name and logo = privacy, we combine both elements by listing the exact verification title 'Verified Privacy Safe' with our tried and true brand name 'TrustLock' for a truly effective trust badge design. After testing several badge phrases, we quickly realized that people understand the phrase ‘Verified Privacy Safe’ more clearly vs. a generic Privacy logo seal or statement text alone. Each time someone loads one of your pages, our system uses conditional logic to ensure that your domain URL is the actual one trying to load the URL and in addition will verify that the site is connected using a true SSL connection. If your browser doesn't load the SSL connection, our badge will not appear to the user when using the Java embedded code. When your visitors hover over any badge with their curser on your site when using Java implementation, they’ll see an expanded understanding of your Privacy verification criteria, furthermore giving greater context to your 'Privacy Safe' verification. If you opt for the iFrame implementation option, a separate hover effect is employed that doesn’t expand outside the frame itself. These various hover effects are optional and available to all TrustLock Privacy Safe subscribers. We strive to give our Verified Privacy Safe subscribers the best value possible by providing more badge designs and options than any other trust badge company offering privacy verifications on the market today. Our other badge designs use the same similar phraseology and concepts used in the success of our original badge. Our badge options give you the flexibility of choosing a badge that fits perfectly with your specific landing page or website! 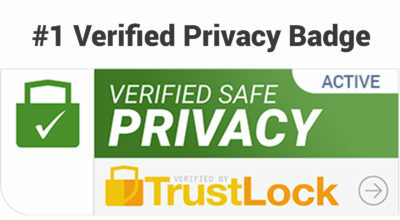 Are you ready to get your site Privacy Verified by TrustLock?